BrasilAgro’s business model is geared towards the transformation of native Cerrado vegetation into productive farmland. This puts 27,242 ha of native vegetation in the Cerrado at risk of deforestation, of which 92 percent is classified as forest. BrasilAgro plans to clear 5,069 ha of remaining native vegetation on its Bahia farms by December 2018. Deforestation is ongoing on Fazenda Chaparral and Fazenda Jatobá, and the company plans to clear all remaining native vegetation within legal boundaries. Since 2012, the company has already cleared 18,393 ha of Cerrado vegetation. BrasilAgro’s deforestation might violate the zero-deforestation commitments of its main clients. In 2016, BrasilAgro lost ADM as a client. Current clients such as Bunge, Louis Dreyfus and Amaggi adopted and strengthened their zero-deforestation policies in 2017. BrasilAgro faces operational and social risks because of its operations in the Cerrado, which is seeing less rainfall due to deforestation and increased competition over water. Annual rainfall has already fallen by 8.4 percent in the last three decades. Conflicts over water have led to occupation and sabotage on farms in vicinity of BrasilAgro’s two farms in Bahia. Recent indicators show that the company’s farms in Matopiba (Maranhão, Tocantins, Piauí, Bahia) are at risk of becoming stranded. Developments include flat prices for Matopiba farmland, threats to the agronomical suitability of BrasilAgro’s farms, and a reduced appetite for recently deforested farms, as illustrated by the recent zero-deforestation commitment of one large institutional land investor. Market access, operational and stranded land risk could be valued at USD 20 million, USD 21-35 million and USD 54-163 million respectively. In a worst-case scenario, net asset value per share would fall by 53 percent to BRL 13.3. That is below the current share price (BRL 15.3; 23 Nov 2018). BrasilAgro’s diversified business model aims to produce value from both commodity production and the acquisition and transformation of ‘underutilized and non-productive land’. The company generates revenues by clearing and developing land and subsequently selling these rural properties. As of Q4 2018, BrasilAgro has 215,137 ha in its portfolio, compared to 225,832 ha last year, spread over 11 properties (8 owned and 3 leased). Ten of the properties are in the Brazilian states of Maranhão, Piauí, Bahia, Minas Gerais, Goiás, and Mato Grosso. One farm is in Paraguay. As shown in Figure 1 (below), BrasilAgro’s Brazilian farms are located in the Cerrado, the savannah biome that is home to unique biodiversity and traditional communities and that plays a crucial role in Brazil’s water systems. BrasilAgro is increasingly focusing on the development and sale of its farmland. The company aggressively acquired farmland between 2006 and 2010, while farm sales and land transformation have increased in the last five years (Figure 2). 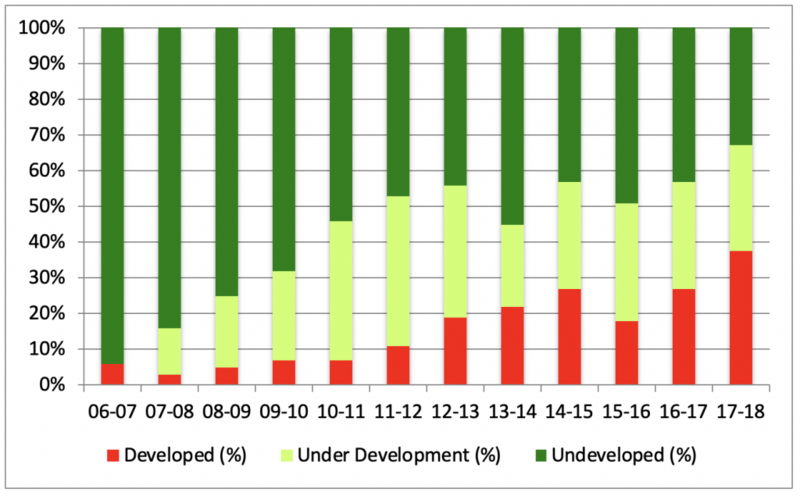 Thirty-three percent (70,995 ha) of BrasilAgro’s land portfolio is undeveloped, compared to 94 percent in 2006 (Figure 3). In November 2018, it sold 103 hectares at its Fazenda Alto Taquari for BRL 8 million (USD 2.1 million). The company has not acquired any new land in the past year. Future development of BrasilAgro’s farms put 27,242 ha of native vegetation in the Cerrado at risk of deforestation. This total includes native vegetation on all of BrasilAgro’s Cerrado farms, except for land set aside as environmental reserves. Legal reserves entail 31,598 ha of the company’s 128,874 total farmland in the Cerrado. Of the 27,242 ha of native vegetation at risk, 92 percent is classified as forest (wooded savanna and forested savanna), based on the vegetation classification standard of Brazil’s Forest Reference Emissions Level (FREL) in the Cerrado Biome. Since November 2017, BrasilAgro has cleared 1,508 ha of native Cerrado, mostly on its Chaparral and Jatobá farms in Bahia. BrasilAgro purchased the 37,182 ha Fazenda Chaparral in Correntina (BA) in November 2007. In 2017/18, the farm was divided between soy (9,596 ha), corn (795 ha), pasture (4,673 ha) and other unspecified crops (3,919 ha). 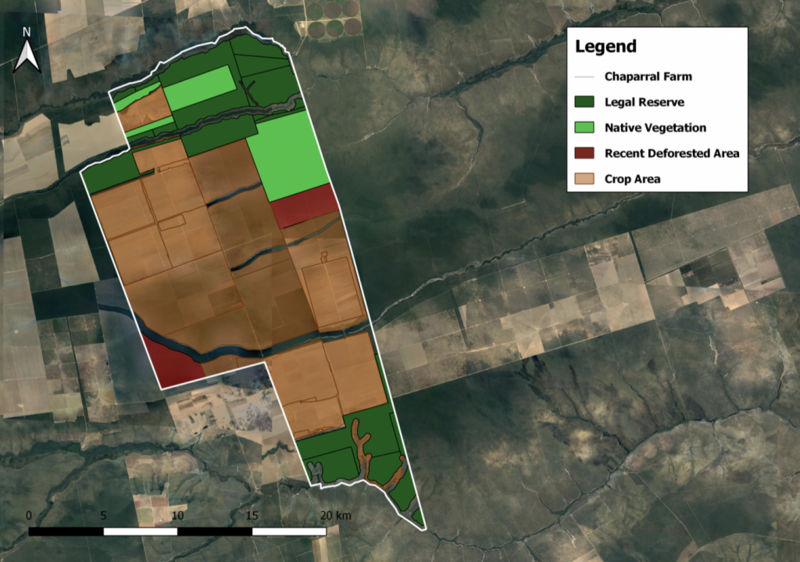 Since November 2017, BrasilAgro cleared 1,491 ha of Cerrado vegetation on Fazenda Chaparral (Figure 4). This action comes on top of the 12,672 ha of the farm’s native vegetation cleared between 2012-2017. The Brazilian Ministry of Environment categorized all native vegetation as Wooded Savanna, which falls under the forest category. The company intends to clear all remaining native vegetation outside of the environmental reserves by December 2018. This entails another 3,417 ha of native Cerrado vegetation. An unpublished environmental impact study from 2014 presented a plan for the deforestation of the Chaparral farm in three phases (Figure 5). In an interview with Rede Social de Justiça e Direitos Humanos (REDE) in October 2018, a regional manager confirmed that the deforestation is currently progressing according to schedule. It is expected to be finalized by the end of this year with the removal of the remaining 3,417 ha of native vegetation. Fazenda Jatobá, located in Jaborandi (Bahia), was purchased on March 5, 2007. In the crop year 2017/18, the farm was divided between soy (4,203 ha), corn (1,433 ha), pasture (5,005 ha) and other unspecified crops (10,252 ha). As of June 2018, the total farm area contains 21,197 ha of land, which includes 6,557 ha of legal reserve. It does not include the area that the company sold earlier this year. In 2018, BrasilAgro sold 9,784 ha of land on Fazenda Jatobá for BRL 177.9 million (USD 48.3 million) to JH Sementes, a Brazilian seed company. In an interview with REDE in October 2018, BrasilAgro’s regional manager indicated that the Jatobá farm is in an excellent location with abundant water, strategic logistical access and robust productivity. These factors have facilitated the sale of part of the farm. Between 2012 and 2017, BrasilAgro cleared 4,213 ha of original vegetation on Fazenda Jatobá (Figure 6). The company cleared an additional 17 ha in 2018. 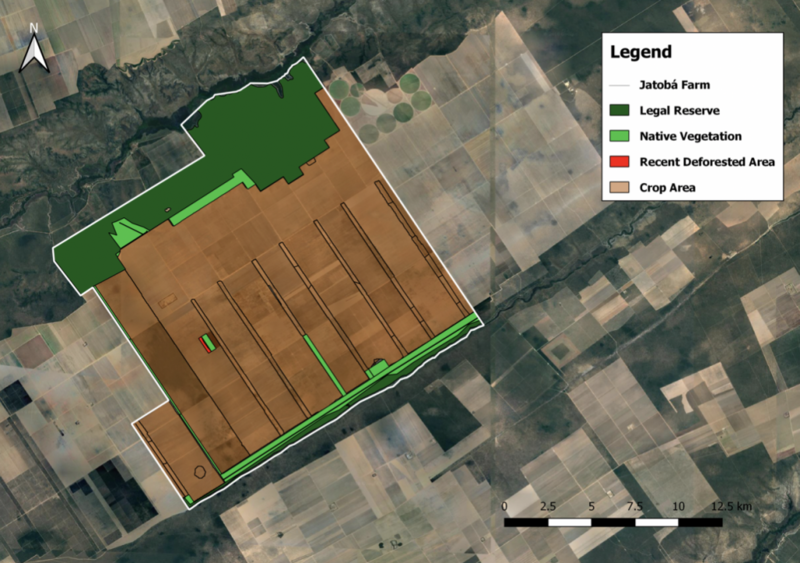 Some 1,652 ha of native vegetation is still left on the farm, excluding the legal reserve. According the regional manager of BrasilAgro in Bahia, the company plans to clear all native vegetation by the end of November 2018. In October 2018, 40 laborers were preparing the farm for deforestation. In response to a draft version of this report, BrasilAgro indicated that all land clearings are taking place in accordance with Brazilian legislation. However, ongoing and planned deforestation at BrasilAgro farms could materialize in a variety of business risks. In 2017, CRR identified that BrasilAgro faced the risk of losing access to clients because of its sustainability impacts. ADM stopped sourcing from BrasilAgro after 2016, and is no longer listed as one of BrasilAgro’s main clients in its most recent financial accounts. It is unconfirmed whether ADM’s zero-deforestation policy and BrasilAgro’s deforestation contributed to this decision. BrasilAgro’s three current clients for its soy and corn produce are Bunge, Cargill and Amaggi, all of which have zero-deforestation policies. Bunge recently said it would strengthen its no-deforestation policy by including legal deforestation and a public non-compliance process. Meanwhile, Cargill has committed to reducing and ultimately eliminating deforestation from its supply chains. Amaggi has also committed to deforestation-free supply chains and is co-developing a monitoring system for its supply chains with the Earth Innovation Institute. Meanwhile, there is continued momentum for the Cerrado Manifesto, which calls on soy producers and their investors to commit to zero deforestation in the Cerrado. As of November 2018, 70 downstream companies signed the Cerrado Manifesto Statement of Support, in addition to 50 investor signatories. Amid this development, BrasilAgro’s continuation of deforestation in the Cerrado exposes the company to market access risks. Reduced productivity: A recent report by CRR shows that rainfed soy production in Matopiba is exposed to the adverse impacts of deforestation and climate change due to agricultural droughts. BrasilAgro’s four Matopiba farms suffered from droughts in the past. During a drought in 2013, BrasilAgro noted that soy yields fell by 31 percent. This operational risk is likely to increase due to the combined effects of ongoing deforestation and climate change on water availability. After significant increases in earlier years, prices for farmland have mostly flattened. In its investor reports, BrasilAgro recognizes that land appreciation in the Cerrado increased 14.9 percent for 2014, compared to only 0.6 percent in 2018 (Figure 7). 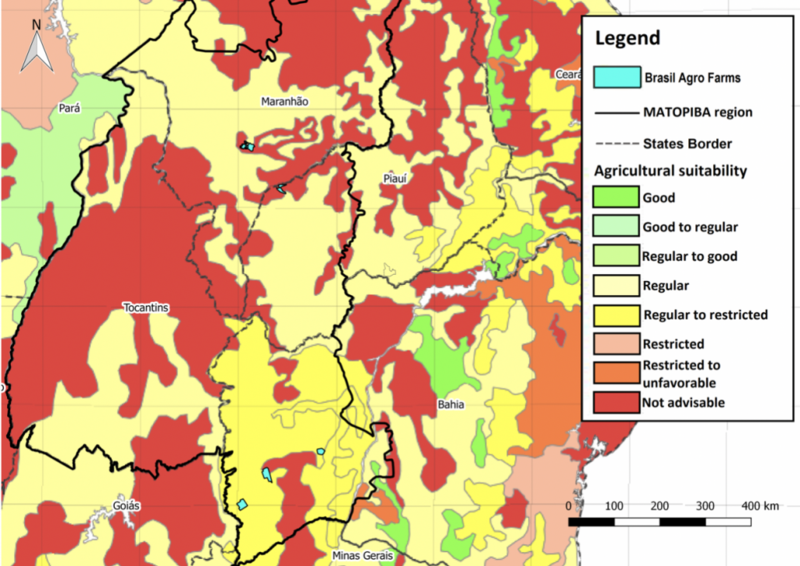 Figure 8: Agricultural suitability of soy areas in Matopiba region. Investor appetite for recently deforested farms has declined. TIAA’s subsidiary Nuveen, the largest foreign farmland investor, recently adopted a zero-deforestation policy for its farmland investments in Brazil. TIAA will not purchase new farms deforested after 2009. Other farmland investors may follow suit, and BrasilAgro could face difficulties finding buyers for deforested farmland. In the financial year 2017/18 (ending June 30, 2018), the planted area increased by 16 percent to 102,857 hectares, of which 19,787 ha was pasture land (for cattle). As productivity (ton per hectare) increased substantially (also due to better weather conditions), net revenues increased by 103 percent to USD 116 million. This growth was also due to higher results from land sales. Of net revenues, 10 percent was due to realized gains on land sales and 26 percent was due to change in the value of biological assets (the value increase of soy, sugar, other grain and cattle growing/feeding on the land). Thus, 64 percent (USD 74 million) was due to farm sales. Of this USD 74 million farm sales, 56 percent was generated in sugar cane and 40 percent in soy/grain. BrasilAgro’s business model is primarily based on the development and value appraisal of land, and less on the crop production. On June 30, 2018, 38 percent of land was developed, 29 percent was under development and 33 percent was undeveloped. On November 6, 2018, BrasilAgro announced results and prospects for FY 2018/19 (ending June 30, 2019). The estimated production area for the 2018/19 harvest is 135,100 hectares (for Brazil and Paraguay), an increase of 31 percent compared to the previous harvest, mainly due to the lease of the Parceria V Farm (announced September 3, 2018). 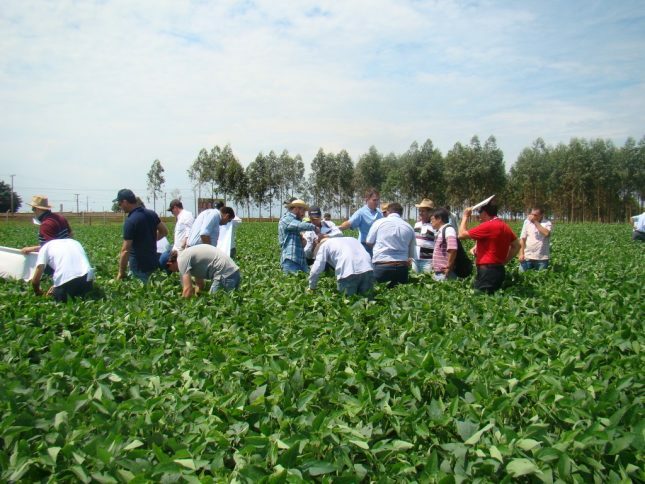 This farm adds 23,600 hectares of mature land in the region of Mato Grosso. In 1Q18/19, net revenues were BRL 242 million, 189 percent higher year-on-year. The increase was mainly due to the revenue of BRL 123.3 million (present value) from the sale of the Jatobá Farm. EBITDA increased sharply to BRL 143 million (versus BRL 31 million) as a result of this land sale. Adjusted net debt was BRL 138 million at September 30, 2018, nearly equal to net debt on June 30, 2018. In 2017/18, BrasilAgro realized 83 percent of its net revenues in its crop/lease operations through five large customers. Each of them generated more than 10 percent of these revenues. In grain (mainly soy), three customers generated 55 percent of sales (57 percent in 2016/17). In sugarcane, the largest segment, two large customers generated 100 percent of the sales. In 2017/18, Bunge (end of June), Amaggi and Cargill generated a total of BRL 55 million (USD 15 million) in net revenues, which is 21 percent of total sales from BrasilAgro’s total crop/lease operations. This excludes the sale of land. In sugarcane, Brenco and ETH Bioenergia are the main clients; they are part of the same group. Brenco/ETH is majority controlled by the Brazilian construction-petrochemicals conglomerate Odebrecht and 33 percent by Japanese trader/conglomerate Sojitz Corp (merger of Nichimen and Nissho Iwai). BrasilAgro’s continuing clearing of forests may lead to revenues-at-risk of BRL 55 million (USD 14 million). If CRR applies a gross/EBITDA margin of 20 percent on these sales, a structural loss of sales to large customers with zero-deforestation policies would lead to an EBITDA reduction of USD 2.8 million. This would translate into a loss of USD 20 million in value (at DCF basis; WACC 10 percent). The potential reduction in EBITDA also affects the net debt/EBITDA ratio (see section on financing). BrasilAgro faces the risk of reduced productivity of land due to drought, particularly in Matopiba. Also, social conflicts due to water can lead to value loss. In 2013, BrasilAgro had to contend with severe droughts at its Northeast farms reducing 31 percent of soy yields. If this risk becomes more structural, a DCF calculation should include a reduction of BrasilAgro’s revenue estimates. The four farms of BrasilAgro in Matopiba have in total 67,846 ha of arable land (total of first and second crop), or 66 percent of the total in BrasilAgro. The next table shows two scenarios for crop yield reduction in Matopiba — 30 percent and 50 percent (production proxy = hectares of arable land). A 30 percent yield reduction on the Matopiba farms could lead to a 20.5 percent negative impact on the overall production of BrasilAgro. The negative impact on net revenue and EBITDA could result into a DCF-based value decline of USD 21.3 million. A negative yield impact of 50 percent would shave off USD 35 million of value. As mentioned above, BrasilAgro faces the risk of stranded land or potential reduction in value as investors may show less appetite for recently deforested land in the Matopiba region. If a value reduction of 25 percent versus current market estimates occurs, the current market value of land (estimated by an independent party, Deloitte Touche Tohmatsu) could be negatively affected by BRL 212 million, or USD 55 million (see table below). The potential negative impact per share is BRL 3.72, or 13 percent of the net asset value per share (BRL 28.27 at 30 June 2018; see valuation section at the end of this study). A 75 percent value reduction scenario for the Matopiba farms would bring about a negative impact of USD 163 million or BRL 11.2 per share. BrasilAgro is 85 percent financed by equity (market value) and 15 percent by net debt (see table below). As the company holds a high amount of cash, gross debt amounted to USD 71 million end of June 2018 (financial year 2017/18). Cresud, a company listed on the Argentinian stock market, control’s 41 percent of BrasilAgro’s shares. Cresud, whose core activity is crop farming and property development in agricultural areas, has no policies on deforestation. CRR’s report on BrasilAgro in 2017 investigated Cresud’s shareholders base: Santander Rio and BNP Paribas, which have zero-deforestation policies, have sold their equity stakes while HSBC Roberts Administradora de Inversion (Argentina) still holds a position of 18 million Argentinian Pesos. HSBC has no deforestation, peat or exploitation commitment for only palm oil. Other shareholders in BrasilAgro made some changes in their positions in the last 12 months. Deutsche Bank, JP Morgan Chase and Banco Citibank are no longer on the list, while Kopernik and Dimensional Fund Advisors increased their positions. These investors have no policies on deforestation. Autonomy Advisors (9.6 percent of the shares) also has no ESG or deforestation policies. Through its own Brazilian office and through BESAF, Credit Suisse Hedging-Griffo Wealth Management is involved in BrasilAgro. Credit Suisse Hedging-Griffo operates as a subsidiary of Banco de Investimentos Credit Suisse (Brasil) S.A. Credit Suisse’s policies on forest are strongly focused on palm oil, RSPO and FSC, and still mostly neglect the Brazilian soy and cattle issues. Figure 14: BrasilAgro: Top-10 shareholders and changes in last 12 months. The largest amount consists of bonds (USD 37 million) owned by an unnamed insurance company. The bonds expire in 2023 and are used for the Chaparral Farm. USD 11 million was for financing agricultural costs (ABC, Itaú) and USD 10 million for Bahia Project Financing, or more specifically the Jatobá and Chaparral Farms (BNB, HSBC). HSBC has adopted NDPE for palm oil. Rabobank is involved in several syndicates with a few banks for a total of USD 11 million. Rabobank says it is ‘involved’ in the Tropical Forest Alliance 2020 against deforestation. Rabobank is a member of RTRS. Additionally, on June 30, 2018, BrasilAgro had several derivatives contracts with Bradesco, Banco Safra and Itaú which totaled USD 3 million. As mentioned above, market access risk could reduce EBITDA by USD 2.8 million. Pro forma net debt/EBITDA 2018/19 would amount to 1.0X (versus 0.9X in the base scenario; see table). As gross debt and net debt (USD 71 and 37 million respectively) is relatively low versus the market value of land properties (BRL 1,26 billion, or USD 324 million), bond holders and banks seem to face a low risk with their lending. The relative valuation of BrasilAgro appears low with respectively 64 and 48 percent discounts in P/E and EV/EBITDA versus the average of a peer group. Note that BrasilAgro’s book gains on land impact the comparison. In P/BV, which is the stronger comparison base in view of the ‘land appreciation’ business model of BrasilAgro, the discount is still 40 percent. Instead of using book value per share (based on historical acquisition price plus additional investments in the land), the net asset value per share (NAV/share) provides an even better insight into the value of the company. This concept is based on market price/fair value estimates. For this land valuation, BrasilAgro hired an independent party, Deloitte Touche Tohmatsu (as also SLC Agricola does). On June 30, 2018, the market value of the portfolio was estimated at BRL 1.26 billion, the basis for the NAV/share calculation on September 30, 2018, which amounted to BRL 28.27. The current share price of BrasilAgro (BRL 15.3 on 23 Nov 2018) is 46 percent below the NAV/share. This is in stark contrast to SLC Agricola, for which the share price (BRL 51.18) is approximately 15 percent above its NAV/share. However, BrasilAgro’s NAV/share needs adjusting for the market access, operational and stranded land risks. The ‘severe’ scenario leads to a NAV/share of BRL 13.31, which is below the current share price of BRL 15.3. The NAV/share of the ‘mild’ scenario (BRL 21.73) is still substantially above the share price. Unlike SLC Agricola (whose share price is above the NAV/share), BrasilAgro has no contracts with a customer like Lidl, which enhances the ESG status of the farmer. The low free float of BrasilAgro’s equity, related to its small market cap and the 41 percent of the shares controlled by Cresud. Note that the value losses per share in a mild and severe scenario are respectively 43 and 98 percent of the share price of BRL 15.3.